Online Slots - Play Slot Machines Online for Real Money! Slot machines are the backbone of any casino. In most live casinos, the number of slots offered is only limited by the amount of space available. They’re the most popular form of gambling and bring in the lion’s share of money for most casinos. In the online casino world, space isn’t an issue – making them an even bigger draw for online gamblers! Online casinos can also offer better odds on their games, bigger progressive jackpots and more interactive games for their players. If you enjoy playing the one-armed bandits in brick-and-mortar casinos, you’ll find that online slot machines are just as fun, and potentially even more lucrative. The contents of this page are outlined below for your convenience. How do online slot games work? Online slots can vary wildly in their formats and payouts, but the basics of how all slot machines work are easy to understand. Most slot machines feature either three or (more commonly, in online games) five reels of symbols. In most cases, the goal will be to match as many symbols as possible on the same line in order to win a large payout. Payouts will vary depending on the specific symbol matched and how many of those symbols appeared on the line at the end of the spin. Players can vary the amount of money they play a slot machine for in three ways. First, the player may play on machines of different denominations – in other words, the amount any one particular “coin” represents in the machine. A “penny slot” would use increments of a penny when determining the total bet, while a nickel, quarter or dollar slot would use those amounts respectively. However, that doesn’t mean that the player is only betting a penny (or whatever denomination is selected) on each spin. The player can also usually choose to play a variable number of coins, often ranging between one and three or one and five. Generally, you may have to play the maximum number of coins to be eligible for the maximum jackpot amounts on a given machine, particularly in the case of progressive jackpots. In addition, the player can choose how many lines to play. Playing just a single line will result in a game that most non-gamblers imagine when they play a slot machine; the center row of symbols is looked at, and if the player has a winning combination on that line, then they win. However, modern slot machines usually allow the player to play multiple lines, sometimes as many as 20 or 30 at a time by using different patterns of symbols on the top, middle and bottom lines. Theoretically, a five-reel slot machine that displays three rows of symbols could create up to 243 “lines” by combining symbols from each reel, but in practice, few machines go beyond 30 or so. Thus, the amount a player is betting on each spin can be expressed as the denomination times the number of coins being played, multiplied by the number of lines being played. Here’s an example: on a penny slot, a player plays five coins at a time, and plays 30 lines. The total amount bet is $0.01 * 5 * 30, or $1.50 per spin. 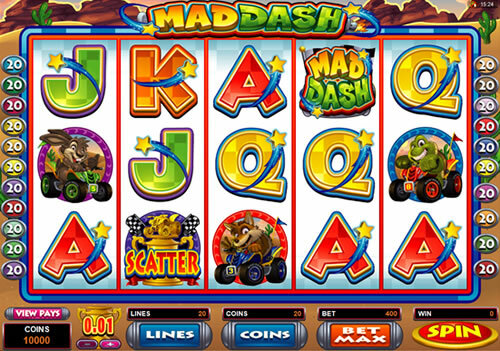 Each online slot machine will allow you to choose the number of coins and lines you wish to play before spinning. Once you’ve made your choice, you may hit the spin button to begin spinning the reels. In most cases, the reels will automatically come to a stop, and prizes will automatically be awarded. If you would like to continue playing with the same options without having to hit spin each time you want to play, most machines also have an auto-spin option that will continue playing for you until you turn the option off. In some online slot machines, you’ll also have the chance to play bonus games when certain symbols or symbol combinations appear on screen. These bonus modes may simply give you bonus spins, or may feature mini-games that allow you the chance to win large prizes by playing games related to the machine’s theme. In some cases, these games may even have a small skill component, though usually they – like the machines themselves – are entirely based on chance. If you want to play slots online for real money, it pays to do your research. While many online games do not clearly post their expected player returns, this information is sometimes available if you search around for it online. When we were able to find this information, we included it in our casino reviews. Beyond the returns offered by each online slot machine, there are other factors that should be taken into consideration before choosing where to play. You might find certain types of slots to simply be more fun than others; some machines tell ongoing stories as you play them, others feature tie-ins with popular television or movie franchises, and some have extensive video portions that can be very engaging. If you’re looking for the biggest possible jackpots, on the other hand, you’ll want to stick to progressive slots, some of which have jackpots that have been hit for millions of dollars! The best advice we can give is to play the games in the free practice mode offered by most online casinos first. This will allow you to try out each machine and figure out what’s the most fun (or the most lucrative) for you before you start spending real money on the machine. It may seem strange to talk about strategy when playing slots, but it turns out that even games of chance sometimes do require some strategic thinking! There actually are a few things you should consider if you want to get the maximum returns from your slot machines. First of all, it’s usually best to play the maximum number of coins in a machine, particularly if it is a progressive slot. Jackpots are usually only given out if a player plays the maximum number of coins allowed. For many progressive jackpots, the player can only win 100% of the jackpot amount if they play (for instance) three coins, can win a smaller amount – perhaps 10% or 20% at most – by playing two coins, and cannot win any of the jackpot by playing a single coin. However, there is another factor that will pull you in the opposite direction when playing online slots. Higher denomination games sometimes offer better returns for the player. We typically suggest combining these two ideas and playing the high denomination at which you are willing to play with the maximum amount of coins. However, if you know for a fact that a higher denomination machine offers better odds, and the ‘bonus’ for playing the maximum number of coins is very small (for instance, when there is not a progressive jackpot and the maximum win is almost the same regardless of the number of coins played), then moving up to the higher limit and playing one coin can be a smart play. Finally, be wary when casinos advertise that they offer machines that promise a high payback. This doesn’t necessarily mean – and in fact, almost certainly doesn’t mean – that every machine in the online casino offers that payout. It’s probably just one particular machine that guarantees the generous returns. If you see an ad that promises a 98% return, find out which machines that applies to before you start playing! Odds on individual games vary wildly, and are not easy to come by. However, it is well known that online games generally offer better odds and lower house edge when compared to their live counterparts. A figure that is often quoted is that machines found in real world casios total somewhere around 92%-93% returns, while online games tend to give back about 95% to the player. Excellent game graphics & interfaces + high payout limits. Fastest industry cashouts. Great software & game choices including large progressive jackpots. Visa, mastercard & e-wallets accepted. Great online slots software & big progressive jackpots. Easy deposit options including all credit cards accepted. It’s impossible to give one single recommendation for the best online casino for slots, as every casino will offer different games that may appeal to you. Some offer more of the classic three or five reel games, while others feature games with video bonus features that allow for more player interaction. Others provide access to huge progressive jackpots, while some may be less flashy, but offer better returns on their games. More recently some interactive 3d games have been released that have proven a massive hit. Our personal recommendation is to look at all sites in the table above and choose which one you like best. We know they all are safe and secure so you have nothing to lose. For a more in-depth review of the kinds of slots available at many different online casinos, check out our online casino reviews. Each review goes into details on what kinds of games you’ll be able to find at each casino, giving you a better idea of which one will give you the experience you’re looking for.